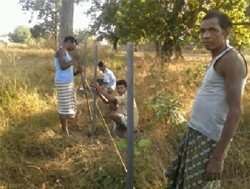 The Badi of 17 Farmers of village Bade Paneda & jawanga , block Geedam are selected for the fencing of two acres land and rupees 38.471 lac sanction from IAP for the fencing work . An open well are digged in each badi from MGNREGA. The farmers were grown various vegetable crop round the year, which fulfill the daily requirement of balance diet and also provide additional income about Rs. 4000/Month by selling of this produce in the local market of Dantewada. So, these schemes not only improving the socio-economic condition of tribal farmers but also improve the health condition as well. Group of 12 interested farmers were selected for Proper implementation of this project. 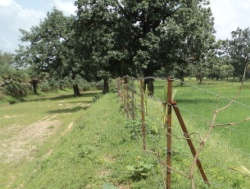 15 ha area has been fenced to protect the mango plants and intercrop from grazing. 4 bore wells & 10 open wells are constructed in mango orchards as a source of irrigation. 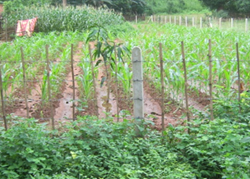 The grafted plants of different varieties are planted at the distance of 10 x 10m. There are approx. 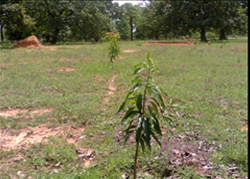 1500 mango plants as well as 1000 plants of karonda and 500 plants of Coconut in the mango orchard model. Kharif & Rabi season crops suitable for intercropping are grown in between the mango plants viz, minor millets, maize, pulses & vegetables. 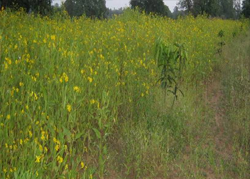 By intercropping of crop farmers can earned around Rs. 40,000 per ha up to 5 years & after 5 year farmers can get around 1.0- 1.5lakh per ha due to production of mango fruits as well as intercropping of crops.